Objective: Early detection of smooth surface lesions is important for appropriate management and monitoring of dental caries. The purpose of this in vitro study was to evaluate the efficacy of laser fluorescence to detect demineralization and remineralization of smooth enamel surfaces. Materials and Methods: In this in vitro study, 132 enamel blocks of semi-impacted human third molars were obtained; artificial caries lesions were induced and they were submitted to the pH-cycling process to create remineralization. Superficial microhardness (SMH) and laser fluorescence (LF) analysis were performed at baseline, after demineralization, and remineralization processes. The data were analyzed by Statistical Package for Social Sciences (SPSS)-16 using analysis of variance (ANOVA), Paired samples t-test, and Pearson's correlation test. Results: There was a significant difference between SMH values at baseline, after demineralization and after remineralization. Also, a statistically significant difference was observed between LF values in these three stages. The LF values increased after demineralization and then decreased after remineralization, and the SMH values decreased after demineralization and increased after remineralization. There was an inverse relationship between SMH and LF only at baseline and after demineralization, but not after remineralization. Conclusion: The results showed that LF is an appropriate method for detection of demineralization in an in vitro condition in smooth enamel lesions, but it was not so efficient in the detection of remineralization. In contrary, Shi et al., (2001) have suggested LF to be efficacious for assessment of smooth-surface caries. These controversies are probably due to different methods used in each study. The aim of this in vitro study was to evaluate the efficacy of DIAGNOdent to detect demineralization and remineralization of smooth enamel surfaces. In this laboratory trial, 54 extracted semi-erupted upper and lower third molars with no clinical signs of caries or white spot, were selected. Two hundred sixteen enamel blocks [four blocks (4 × 4 mm) for each tooth] were obtained by mesiodistal and buccolingual sections from each tooth with disc and mandrel (D and Z, Germany). The specimens were cleaned and washed with water, then stored in distilled water at room temperature. Each block was mounted in epoxy resin for a suitable surface microhardness analysis. Then the specimens were polished serially by Diamondpro (FGM Dental Products, Joinville, Brazil). The microhardness analysis was done by microhardness tester using Vicker diamond (COOPA, MIH, Iran) under a 50 g load for 10 seconds. From 216 blocks, only those with hardness of 338.02 ± 30.31 VMHn (Vicker Microhardness No) were selected for artificial caries lesion induction and the others were excluded from the study, due to their high variable microhardness values. A laser fluorescence device (LF2190, DIAGNOdent, Kavo, Biberach, Germany) with probe tip B was used in our study. Two operators read LF to ensure validity of the observation and the inter-observer agreement was determined before the assessment. The device was calibrated against a porcelain standard before reading and after testing each 5-6 blocks. Then each block was dried with gauze. The probe tip B was kept perpendicular to the tooth surface. The blocks were placed in an incubator for 36 hours at 37°C. The surface hardness test was done again after demineralization, and mean and standard deviation (SD) were calculated and 132 blocks with SMH 67.57 ± 24.14 were selected for pH-cycling process. The other 40 blocks were excluded from the study due to large differences in the mean and standard deviation after demineralization. PH-cycling method was done as follows: A fluoride dentifrice containing 1450 ppm (Stannous Fluoride, Crest 7 complete expert, Germany) was applied. PH-cycling process includes 1 minute soaking in 100 ml 33% (w/v) dentifrice/water slurries four times per day (8:00 A.M., 10 A.M., 2:30 P.M., and 4:30 P.M.) to stimulate tooth brushing exposure [Paes Leme  . Then the blocks were washed with deionized water and immersed in 4 ml of artificial saliva (BioXtra Alcohol free Mouthwash, Biohelp, Belgium) at 37°C. Thereafter, they were immersed in 12 ml of a demineralization solution from 12 A.M. to 2 P.M. to mimic the acidic conditions of oral cavity. The continuous demineralization and remineralization cycles were done for 6 days. The solution was replaced after 3 days. After this stage, LF reading and SMH were recorded again for each block and the results were compared to the results of baseline and after demineralization. The data were analyzed by Statistical Package for Social Sciences (SPSS)-16 using analysis of variance (ANOVA), Paired samples t-test, and Pearson's correlation test. The results showed no statistically significant difference in mean DIAGNOdent readings between two operators at baseline (P = 0.699), after demineralization (P = 0.774), and after remineralization phases (P = 0.161). According to Pearson's correlation test, the inter-examiner correlation was 0.94, 0.99, and 0.97 at baseline, after demineralization phase, and after remineralization phase, respectively. 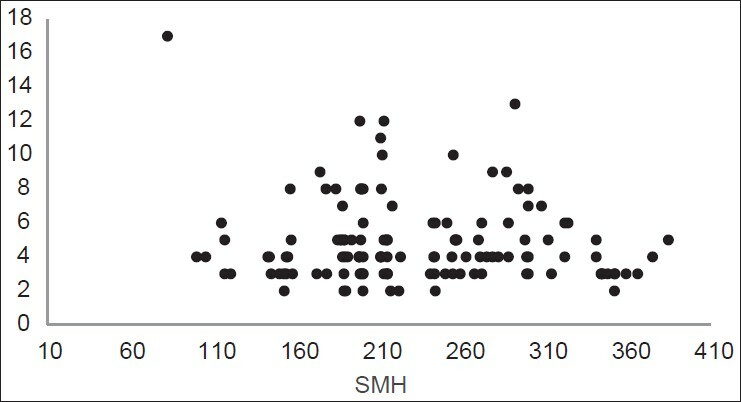 [Table 1] shows the mean values of SMH and LF readings at three different times, and [Table 2] shows two by two comparisons of SMH and LF readings in three stages. The comparison between baseline and demineralization, between baseline and remineralization, and between demineralization and remineralization values showed significant difference (P < 0.001, P < 0.002, and P < 0.001, respectively). The results showed that microhardness was significantly decreased after demineralization, and was significantly increased after remineralization that was still lower than baseline. The distribution of LF values according to SMH is shown in [Figure 1], [Figure 2], and [Figure 3]. [Figure 1] shows the inverse linear relationship between DIAGNOdent and microhardness values at baseline. Also the same result was found after demineralization [Figure 2], but this inverse linear relationship was not observed after remineralization [Figure 3]. In current study, the inter-examiner agreement was between 0.94 and 0.99. Kuhnish et al., in an in vitro study to assess the reliability of DIAGNOdent measurement,  and Aljehani et al., found the values of inter-examiner agreement to be 0.93-0.98 and 0.91-0.99, respectively. These two studies were in agreement with our study that showed excellent ICC. Diniz found ICC to be between 0.51 and 0.61, that was different from our results. This is probably due to technical errors, so it is necessary to train the operators before experiment. In the current research, the comparison of the results of LF at baseline and after demineralization showed a significant difference. Diniz et al.,  Shi et al.,  and Mendes et al.,  reported no statistically significant difference that can be related to some misdiagnoses, such as inadequate diagnosis of minor changes in inorganic components by LF. It may probably be due to differences in demineralization solutions, pH-cycling procedures, and artificial solutions. The LF values were increased after demineralization and then decreased after remineralization, but they were still higher from baseline, this can be due to some factors such as operator errors. We also used SMH as a standard and results showed a significant decrease in microhardness after demineralization and an increase after remineralization. The increased mean LF reading after pH-cycling than baseline was similar to Gokalp and Baseren's results  and inconsistent with Mendes et al., study. This can be explained by the difference in samples (primary or permanent teeth). Some factors can produce different results in different studies, such as different toothpastes components or artificial solutions, different maintenance solutions (thymol, formalin, chloramines or saline or distilled water), different cut-off limits of manufacturers for LF,  type of the study (in vivo or in vitro), condition of the study and sample selection (bovine, hypomineralized, primary, or permanent teeth). We found increased DIAGNOdent and decreased microhardness values after demineralization that followed by a decrease in DIAGNOdent and an increase in microhardness values after remineralization, but it did not reach the baseline value. These increasing or decreasing trends were in consistent with Diniz  and Spiguel  studies, but the values of the current study were higher than Diniz, probably due to the usage of human teeth instead of bovine teeth, different storage solutions, different demineralization and remineralization solutions, and different pH-cycling processes. The DIAGNOdent values increased after demineralization and then decreased after remineralization. The microhardeness values decreased after demineralization and increased after remineralization. There was an inverse linear relationship between DIAGNOdent and microhardness values at baseline and after demineralization, but not after remineralization. DIAGNOdent is an appropriate device for detection of demineralization processes in smooth enamel lesions, but it was not so efficient in the detection of remineralization in an in vitro condition. 1. Spiguel MH, Tovo MF, Kramer PF, Franco KS, Alves KM, Delbem AC. Evaluation of laser fluorescence in the monitoring of the initial stage of the de-/ramineralization process: An in vitro and in situ study. Caries Res 2009;43:302-7. 2. Pretty IA. Caries detection and diagnosis: Novel technologies. J Dent 2006;34:727-39. 3. Kishen A, Shrestha A, Rafigue A. Fiber optic backscatter spectroscopic sensor to monitor enamel demineralization and remineralization in vitro. J Conserv Dent 2008;11:63-70. 4. Mendes FM, Siqueira WL, Mazzitelli JF, Pinheiro SL, Bengtson AL. Performance of DIAGNOdent for detection and quantification of smooth-surface caries in primary teeth. J Dent 2005;33:79-84. 5. McDonald RE, Avery DR, Stookey GK, Chin JR, Kowolik JE. Dental caries in the child and adolescent. In: Dean JA, Avery DR, McDonald RE, editors. Dentistry for the Child and Adolescent. Missouri: Mosby; 2011. p. 187. 6. Aljehani A, Bamzahim M, Yousif MA, Shi XQ. In vivo reliability of an infrared fluorescence method for quantification of carious lesions in orthodontic patients. Oral Health Prev Dent 2006;4:145-50. 7. Hibst R, Paulus R, Lussi A. Detection of occlusal caries by laser fluorescence: Basic and clinical investigations. Med Laser Appl 2001;16:205-13. 8. Buchalla W, Attin T, Niedmann Y, Niedmann PD, Lennon AM. Porphyrins are the cause of red fluorescence of carious dentin: Verified by gradient reversed-phase HPLC. Caries Res 2008;42:223. 9. Amaechi BT. Emerging technologies for diagnosis of dental caries: The road so far. J Appl Phys 2009;105:102047. 10. Shi XQ, Tranaeus S, Angmar-Mansson B. Comparison of QLF and DIAGNOdent for quantification of smooth surface caries. Caries Res 2001;35:21-6. 11. Diniz MB, Leme AF, Cardoso Kde S, Rodrigues Jde A, Corderio Rde C. The efficacy of laser fluorescence to detect in vitro demineralization and remineralization of smooth enamel surfaces. Photomed Laser Surg 2009;27:57-61. 12. Pinelli C, Campos Serra M, de Castro Monteiro Loffredo L. Validity and reproducibility of a laser fluorescence system for detecting the activity of white-spot lesions on free smooth surfaces in vivo. Caries Res 2002;36:19-24. 13. Mendes FM, Nicolau J. Utilization of laser fluorescence to monitor caries lesions development in primary teeth. J Dent Child (Chic) 2004;71:139-42. 14. Mendes FM, Nicolau J, Duarte DA. Evaluation of the effectiveness of laser fluorescence in monitoring in vitro remineralization of incipient caries lesions in primary teeth. Caries Res 2003;35:442-4. 15. Doerner MF, Nix WD. A method for interpreting data from depth-sensing indentation measurement. J Mater Res 1986;1:601-9. 16. Rehder Neto FC, Maeda FA, Turssi CP, Serra MC. Potential agents to control enamel caries-like lesions. J Dent 2009;37:786-90. 17. Huysmans MC, Longbottom C. The challenges of validating diagnostic methods and selecting appropriate gold standards. J Dent Res 2004;83:C48-52. 18. Pai D, Bhat SS, Taranath A, Sargod S, Pai VM. Use of laser fluorescence and scanning electron microscope to evaluate remineralization of incipient enamel lesions remineralized by topical application of casein peptide amorphous calcium phosphate (CPP-ACP) containing cream. J Clin Pediatr Dent 2008;32:201-6. 19. Paes Leme AF, Tabchoury CP, Zero DT, Cury JA. Effect of fluoridated dentifrice and acidulated phosphate fluoride application on early artificial carious lesions. Am J Dent 2003;16:91-5. 20. Tranaeus S, Shi XQ, Angmar-Mansson B. Caries risk assessment: Method available to clinicians for caries detection. Community Dent Oral Epidemiol 2005;33:265-73. 21. Craounanidy U, Sathyanarayanan R. Dental caries: A complete changeover (Part II)-Changeover in the diagnosis and prognosis. J Conserv Dent 2009;12:87-100. 22. Kuhnisch J, Ziehe A, Bradstadt A, Heinrich-Weltzein R. An in vitro study of the reliability of DIAGNOdent measurements. J Oral Rehabil 2004;31:895-9. 23. Jablonski-Momeni A, Ricketts DN, Rolfsen S, Stoll R, Heinzel-Gutenbrunner M, Stachniss V, et al. Performance of laser fluorescence at tooth surface and histological section. Lasers Med Sci 2011;26:171-8. 24. Guimaraes AR, Vieira RD, Minamisako MC, Modesto A, Cury JA. DIAGNOdent vs. SMH in non-cavitated caries lesions monitoring. IADR/AADR/CADR 83 rd General Session. March 9-12, 2005. 25. Silva BB, Severo NB, Maltz M. Validity of diode laser to monitor caries lesions in pits and fissures. J Dent 2007;35:679-82. 26. Celiberti P, Leamari VM, Imparato JC, Braga MM, Mendes FM. In vitro ability of a laser fluorescence device in quantifying approximal caries lesions in primary molars. J Dent 2010;38:666-70. 27. Gokalp S, Baseren M. Use of laser fluorescence in monitoring the durability and cariostatic effects of fluoride and chlorhexidine varnishes on occlusal caries: A clinical study. Quintessence Int2005;36:183-9. 28. Diniz MB, Rodrigues JA, de Paula AB, Cordeiro Rde C. In vivo evaluation of laser fluorescence performance using different cut-off limits for occlusal caries detection. Lasers Med Sci 2009;24:295-300. 29. Buzalaf MA, Hannas AR, Magalhaes AC, Rios D, Hornorio HM, Delbem AC. PH-cycling models for in vitro evaluation of the efficacy of fluoridated dentrifrices for caries control: Strengths and limitations. J Appl Oral Sci 2010;18:316-34.